Finished Goods Labeling is critical for proper flow and routing of product to its ultimate destination - whether it's placed into inventory or shipped directly to the customer. But it's often a manual process that is prone to costly errors. Labels are pre-printed in batches, the worker must sort through the batch to find the correct label and adhere it to the correct product. The product is then placed into inventory or shipped to a customer- only to be discovered days or weeks later that it's the wrong item. This creates a return and a potentially lost customer. 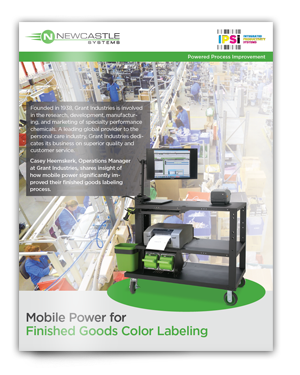 Mobile Power Technology enables you to print directly at the product - ensuring accurate labeling while eliminating costly motion to and from static printers. Eliminating motion can double productivity and allow your workers to build, pack, move, and ship more goods FASTER. The Mobile Powered Workstation has transformed inbound and outbound labeling in the logistics world. It can also be leveraged in a manufacturing environment to radically change the outcomes and improve your metrics in this critical process area while achieving a positive ROI in less than 6 months. 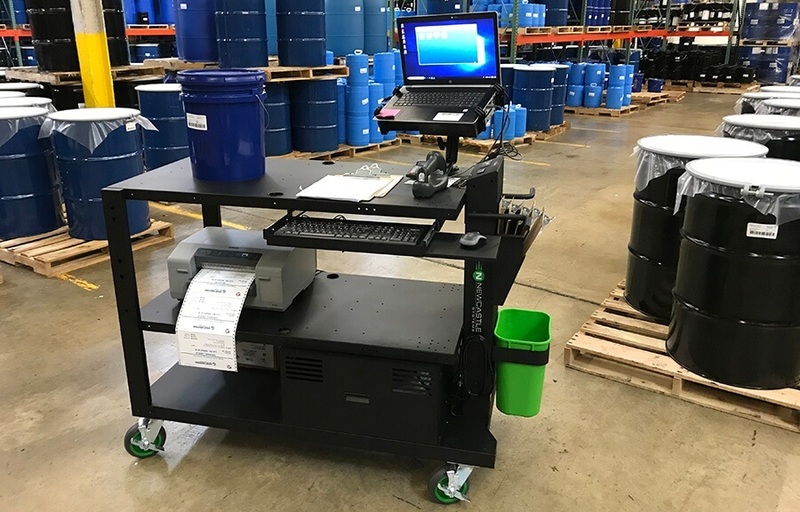 Casey Heemskerk, Operations Manager at Grant Industries, a leading manufacturer of specialty performance chemicals for the personal care market, shares insight of how mobile powered printer stations improved their finished goods labeling process while significantly boosting their turn-around times and on-time shipments. To learn more about the best solution for your finished goods labeling process, contact your account manager, or request a quote today!